Hazel Holt originated from Birmingham, England, where she attended King Edward VI High School for Girls. She studied at Newnham College, Cambridge, and went on to work at the International African Institute in London, where she became acquainted with the novelist Barbara Pym, whose biography she later wrote. 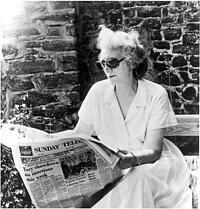 Holt wrote her first novel in her sixties and was best known for her "Sheila Malory" series. Her son is the novelist Tom Holt.